The analysis of the financial crises and their impact to several sectors has been the centre of attention for many years of several academics. 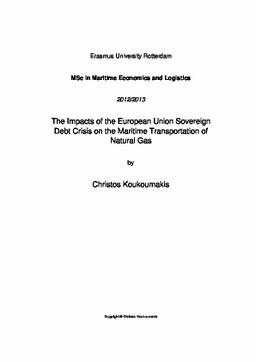 The purpose of this thesis is to investigate the impacts of the European Union Sovereign Debt Crisis to the liquefied natural gas trade, or by other words the maritime trade of natural gas. Therefore, an analysis of the past financial crisis will be done in order to hypothesize the demand and supply shock that we are going to implement on the natural gas trade by sea. Furthermore, an analysis of the production, consumption, the maritime trade of natural gas, the market shares of oil, coal and natural gas will be done until 2007 and from 2008 until 2012, in order to analyse the real impacts of the European Union Sovereign Debt Crisis. Furthermore, three scenarios of demand and supply shocks will be implemented in the Global Simulation (GSIM) model, in order to forecast the changes in the maritime trade of natural gas. More specifically, the first scenario, which is called the optimistic scenario, includes a positive change in the production and consumption of natural gas. The second scenario, which is called the neutral scenario, will include lower positive changes in the consumption and production of natural gas than the first scenario. Hence, the third scenario, or otherwise the pessimistic one, will include very low positive changes in production and consumption of natural gas in all regions, except the European that will be implemented with a negative change in both supply and demand of natural gas. Therefore, the results of the real changes and the forecast ones will be compared in order to conclude to the probity of the scenarios’. All the above will be done for concluding to the real impacts of the European Union Sovereign debt crisis to the liquefied natural gas trade. Finally, it must be mentioned that all the above will be done by implementing the ‘ceteris paribus’ term, which stands for ‘all the other variables remain stable’.